It’s been a season of what if’s for Hatters according to top scorer Danny Hylton. 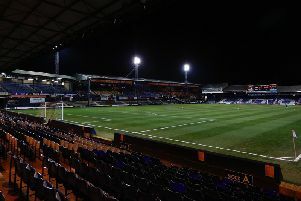 Luton’s 1-1 draw at Mansfield on Easter Monday made it just two points over the Easter period after struggling Leyton Orient held Town 2-2 at Kenilworth Road on Good Friday. It’s a real what if, but we can’t do anything about it now, we’ve just got to make sure we secure the play-offs. It meant that Luton have now drawn 17 of their 46 league games this season, 13 by a 1-1 scoreline, as they saw their automatic promotion homes ended too. On his side’s inability to consistently pick up victories this term, Hylton said: “I said after the Orient game, too many draws. “If we had not had so many, I fancy us to be in the top three. “We were going through games sitting in the changing room and talking as you do, mentioned a few games and looked back on some and you think if we had just not drawn that one. “There were some real opportunity games, you look at games like Grimsby where I missed penalty in the last minute. “We went through a few and even today (Monday), I missed a few chances, two headers that I should have done better with. “It’s a real what if, but we can’t do anything about it now, we’ve just got to make sure we secure the play-offs. Hylton had been unusually quiet in the first period on Monday, as boss Nathan Jones felt a few others had as well, saying: “He was way off it first half, him (Hylton) and Isaac (Vassell) were way off it. “We couldn’t get him into the game, Pelly Ruddock wasn’t at it, we couldn’t get Dan Potts into the game. “But then as soon as we actually stepped on a yard and showed a little bit more bravery, we came into the game a bit more. Hylton went even further than his manager when describing his first half showing, saying: “That was the probably the worst I’ve ever played in my whole life the first half and the gaffer made sure he told us. “He said he needed more from me. “Vassy was huffing and puffing as well, but there was no real service.